The atmosphere is an envelope of air that surrounds the Earth and rests upon its surface. It is as much a part of the Earth as the seas or the land, but air differs from land and water as it is a mixture of gases. It has mass, weight, and indefinite shape. The atmosphere is composed of 78 percent nitrogen, 21 percent oxygen, and 1 percent other gases, such as argon or helium. Some of these elements are heavier than others. The heavier elements, such as oxygen, settle to the surface of the Earth, while the lighter elements are lifted up to the region of higher altitude. Most of the atmosphere’s oxygen is contained below 35,000 feet altitude. When most people hear the word “fluid,” they usually think of liquid. However, gasses, like air, are also fluids. Fluids take on the shape of their containers. Fluids generally do not resist deformation when even the smallest stress is applied, or they resist it only slightly. We call this slight resistance viscosity. Fluids also have the ability to flow. Just as a liquid flows and fills a container, air will expand to fill the available volume of its container. Both liquids and gasses display these unique fluid properties, even though they differ greatly in density. Understanding the fluid properties of air is essential to understanding the principles of flight. Viscosity is the property of a fluid that causes it to resist flowing. The way individual molecules of the fluid tend to adhere, or stick, to each other determines how much a fluid resists flow. High-viscosity fluids are “thick” and resist flow; low-viscosity fluids are “thin” and flow easily. Air has a low viscosity and flows easily. Using two liquids as an example, similar amounts of oil and water poured down two identical ramps will flow at different rates due to their different viscosity. The water seems to flow freely while the oil flows much more slowly. As another example, different types of similar liquids will display different behaviors because of different viscosities. Grease is very viscous. Given time, grease will flow, even though the flow rate will be slow. Motor oil is less viscous than grease and flows much more easily, but it is more viscous and flows more slowly than gasoline. All fluids are viscous and have a resistance to flow, whether or not we observe this resistance. We cannot easily observe the viscosity of air. However, since air is a fluid and has viscosity properties, it resists flow around any object to some extent. Another factor at work when a fluid flows over or around an object is called friction. Friction is the resistance that one surface or object encounters when moving over another. Friction exists between any two materials that contact each other. The effects of friction can be demonstrated using a similar example as before. If identical fluids are poured down two identical ramps, they flow in the same manner and at the same speed. If the surface of one ramp is rough, and the other smooth, the flow down the two ramps differs significantly. The rough surface ramp impedes the flow of the fluid due to resistance from the surface (friction). It is important to remember that all surfaces, no matter how smooth they appear, are not smooth on a microscopic level and impede the flow of a fluid. Molecules of air pass over the surface of the wing and actually adhere (stick, or cling) to the surface because of friction. Air molecules near the surface of the wing resist motion and have a relative velocity near zero. The roughness of the surface impedes their motion. The layer of molecules that adhere to the wing surface is referred to as the boundary layer. Once the boundary layer of the air adheres to the wing by friction, further resistance to the airflow is caused by the viscosity, the tendency of the air to stick to itself. When these two forces act together to resist airflow over a wing, it is called drag. Pressure is the force applied in a perpendicular direction to the surface of an object. Often, pressure is measured in pounds of force exerted per square inch of an object, or PSI. An object completely immersed in a fluid will feel pressure uniformly around the entire surface of the object. If the pressure on one surface of the object becomes less than the pressure exerted on the other surfaces, the object will move in the direction of the lower pressure. Although there are various kinds of pressure, pilots are mainly concerned with atmospheric pressure. It is one of the basic factors in weather changes, helps to lift an aircraft, and actuates some of the important flight instruments. These instruments are the altimeter, airspeed indicator, vertical speed indicator, and manifold pressure gauge. Air is very light, but it has mass and is affected by the attraction of gravity. Therefore, like any other substance, it has weight, and because of its weight, it has force. Since air is a fluid substance, this force is exerted equally in all directions. Its effect on bodies within the air is called pressure. 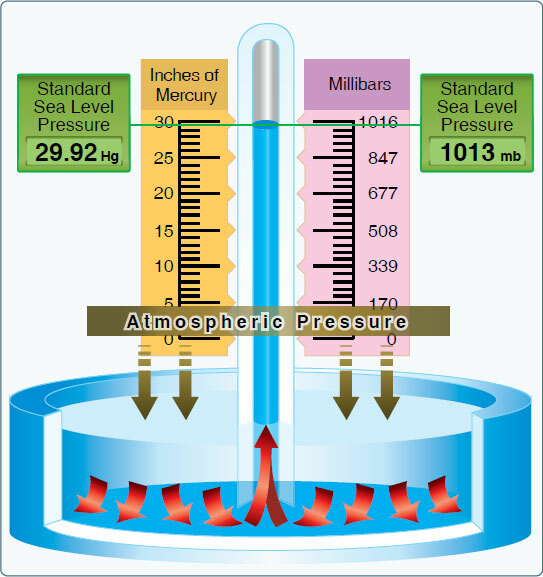 Under standard conditions at sea level, the average pressure exerted by the weight of the atmosphere is approximately 14.70 pounds per square inch (psi) of surface, or 1,013.2 millibars (mb). The thickness of the atmosphere is limited; therefore, the higher the altitude, the less air there is above. For this reason, the weight of the atmosphere at 18,000 feet is one-half what it is at sea level. Figure 4-2. Standard sea level pressure. A standard temperature lapse rate is when the temperature decreases at the rate of approximately 3.5 °F or 2 °C per thousand feet up to 36,000 feet, which is approximately –65 °F or –55 °C. Above this point, the temperature is considered constant up to 80,000 feet. A standard pressure lapse rate is when pressure decreases at a rate of approximately 1 “Hg per 1,000 feet of altitude gain to 10,000 feet. [Figure 4-3] The International Civil Aviation Organization (ICAO) has established this as a worldwide standard, and it is often referred to as International Standard Atmosphere (ISA) or ICAO Standard Atmosphere. Any temperature or pressure that differs from the standard lapse rates is considered nonstandard temperature and pressure. Figure 4-3. Properties of standard atmosphere. Since aircraft performance is compared and evaluated with respect to the standard atmosphere, all aircraft instruments are calibrated for the standard atmosphere. In order to properly account for the nonstandard atmosphere, certain related terms must be defined. Pressure altitude is the height above a standard datum plane (SDP), which is a theoretical level where the weight of the atmosphere is 29.92 “Hg (1,013.2 mb) as measured by a barometer. An altimeter is essentially a sensitive barometer calibrated to indicate altitude in the standard atmosphere. If the altimeter is set for 29.92 “Hg SDP, the altitude indicated is the pressure altitude. As atmospheric pressure changes, the SDP may be below, at, or above sea level. 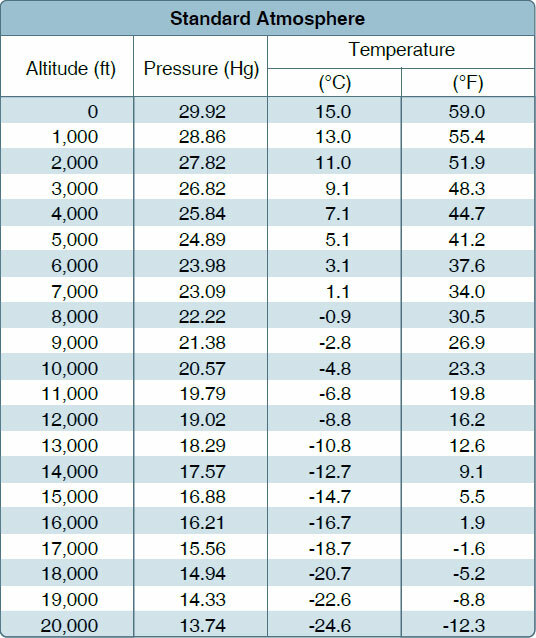 Pressure altitude is important as a basis for determining airplane performance, as well as for assigning flight levels to airplanes operating at or above 18,000 feet.